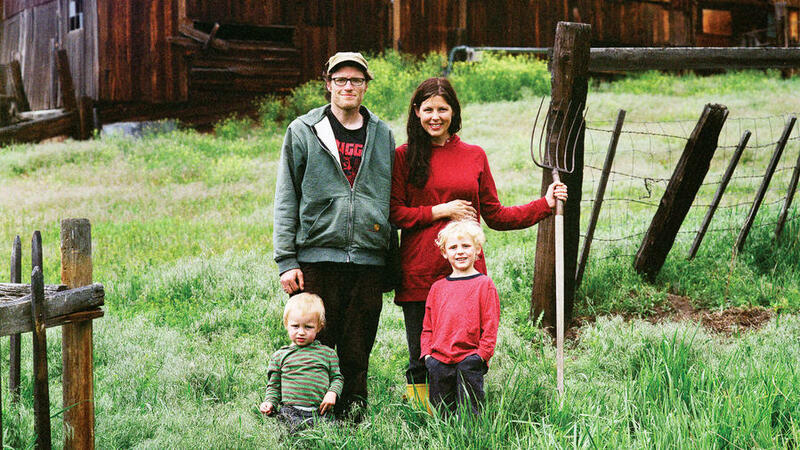 The Smetanka family at their home on the Moon-Randolph Homestead in Missoula, Montana. And what counts as hard-core? Her husband, Andy, smoking out a skunk near the chicken coop. Joanna using a chamber pot while 9 months pregnant because of a finicky composting toilet. She didn’t bother mentioning tending 18 chickens. Or Andy digging out the caved-in root cellar. Or raising two preschoolers without modern plumbing. Or hauling groceries by sled a quarter-mile up the road when the road ices over. The Moon-Randolph Homestead is open to visitors on Saturdays between May 1 and October 31. 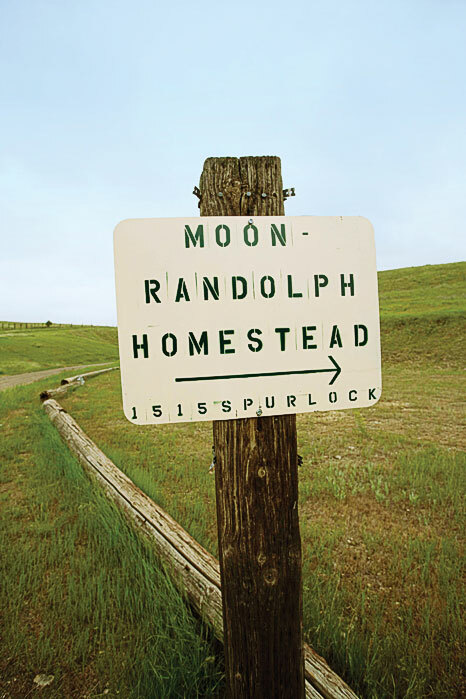 That’s all part of the Smetankas’ job as caretakers of the Moon-Randolph Homestead, 13 hilly acres 3 miles from downtown Missoula. Moon-Randolph Homestead caretaker Joanna Smetanka tends to 18 chickens, two goats, and two preschoolers on their pioneer homestead in Montana. In exchange for living rent-free in a converted chicken coop, the Smetankas care for the land and livestock; maintain the buildings, including the original 1889 Moon cabin; coordinate a Maypole party and harvest festival; and greet visitors every summer Saturday, 11 a.m. to 5 p.m.
All this may sound tame compared with the lives of the original homesteaders. Ray and Luella Moon began eking out a living on the 160-acre claim in 1889: cultivating 30 acres or so, grazing a few cattle, planting cherry and apple trees. By 1894, they’d “proved up”—i.e., earned the title to the land by sticking it out for five years—but then, worn down, perhaps, by the baking-hot summers and frozen winters, sold out to their relatives George and Helen Moon. William and Emma Randolph bought the land in 1907, raising chickens, hogs, and cattle; selling milk, fruit, and vegetables; and even mining coal to get by. Their son William Randolph Jr. lived alone here until his death in 1996. Bought by the city to be preserved as open space, the land went out of production and “slipped into the eddy of time” as Caitlin DeSilvey wrote in her excellent history of the property, Butterflies and Railroad Ties. The hardscrabble ranch is an homage to homestead-era grit and Depression-era resourcefulness. Walk anywhere on the property, and present overlaps the past. Along with 18 chickens, the Moon-Randolph Homestead’s livestock population includes 2 goats, and about 30 sheep. Even Joanna’s blog echoes the 1917 journal of 13-year-old Robert: “We have been one sick family for the past two weeks,” she wrote April 8, 2010. The Smetankas feel the shift between past and present most when they go into town, where Andy reviews movies for the weekly Missoula Independent and works at a bakery and Joanna co-owns a kids’ clothing store. “It’s like straddling two centuries,” says Joanna from the couch of the converted coop, which is bright with windows but small: just a family bedroom, a living room and kitchen, and a “project room” large enough for a computer (yes, they have electricity), sewing machine, and art supplies. Andy and Joanna did not come here to flee civilization, but to live, Joanna says, at an “appealing distance” from town. “The longer I’m here, the more off the grid I want to become,” she adds. Andy, on the other hand, says that while he enjoys sharing responsibility for the kids and homestead, at times he misses town life. These sentiments echo those of the original Ran-dolphs: Emma wanted the farm; William dreamed of becoming an inventor—his mouse-nibbled “torpedo exploder” diagram still hangs in the family room. But that duality of spirit is the nature of homesteading.